1. Port wine is fortified, usually with strong spirits of varying sorts. The end result is typically between 18% and 20% in strength, v. a typical 11% to 14.5%. 2. Unless you’re grandfathered into your old labels, you can’t start making fortified wine and call it “port” anymore, thanks to a treaty the US signed about ten years ago. 3. Port and her friends can be red or white, though red is much more common. 4. Port-style wine is often aged a bit longer, sometimes up to forty years, but many people drink it shortly after bottling. 5. Port most commonly comes in “ruby” and “tawny.” Ruby is fruitier, brighter crimson in color, and has a much nicer bouquet (smell). Tawny is aged longer, during which time it loses some color and fruit flavor, but gains a complexity that ruby ports typically don’t possess. One of the better-known but perhaps less frequented stops on the Napa wine scene is Sutter Home. To be honest, we might have passed it up when we saw it, too, but the “free tasting” sign out front drew us in. That was in 2013. Inside Sutter Home, we were delighted. No, we didn’t want to try the White Zin that made them famous, but we discovered that their estate bottled stuff is really good, and in particular they make a very nice port and an even more fantastic triple cream, both of which come at prices that no other place in Napa we have found can match. So now when we’re in Napa, we hit up Sutter Home for a bottle (or six) every time. It’s a great place, and we recommend you visit them. On our last visit, we made it a point to ask those “in the industry” where we ought to go next. At Sutter Home, having just purchased a fair amount of Port wine, the girl behind the counter didn’t hesitate. “Prager,” she said. “It’s half a block from here, down the alley, and they make great Port.” We thanked her and set off on foot. Prager is indeed just down the alley from Sutter Home. It wouldn’t be hard to miss. * We found the door and swung inside, but instead of stopping at their nicely arranged tasting room, we walked toward the light and the noise and ended up joining the Prager family and a few other tasters in the kitchen area where they make (and store) much of their wine. There we sampled several Ports, all of them delightful, eventually deciding on the white varietal for its uniqueness and quality to take home. One great thing about Prager is that the guys working the shop are actually the Pragers. They’re pleasant and knowledgeable and clearly invested in what they do. Another plus is that, in a rare move, they sell their Port in 750ml bottles, rather than the 350ml or occasional 500ml that are more common to fortified and late harvest wines. Still another benefit to Prager is that, unlike so much of the Napa scene, they haven’t dumped a decade worth of profit into their tasting room, offering granite counter tops, statues, fountains and so forth, but earning it back on their wine. The result is a 750ml bottle of delightful Port in the $50 range (350ml bottles in Napa typically run from $35-$55). 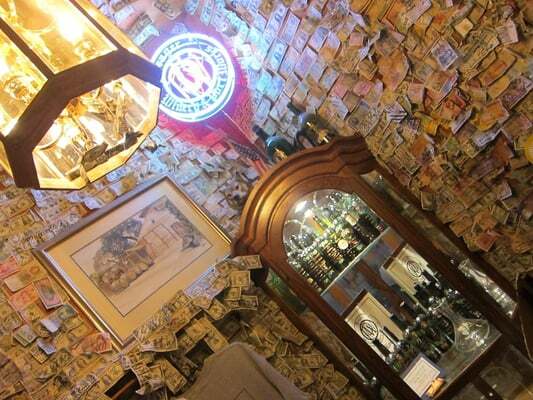 The walls of the Prager outfit are covered in dollar bills and currency from around the world, stapled up, often signed by those who contributed it. “Pizza money,” one of the brothers called it jokingly. It created an ambiance that was casual, and made for a really enjoyably wine tasting experience not terribly unlike that at Sutter Home. At the end of our tasting, the Pragers all got together and signed our bottle for us. It’s something we’ll keep for years, long after the wine is gone, probably forever. Most places in Sonoma and Napa offer a Port, and most of it is pretty good. Similarly, even here in Nebraska, James Arthur Vineyards, Glacial Till, and probably others we don’t know about are making nice fortified wines. If you’re in Napa anytime soon, I’d encourage you to visit the Prager brothers. I know you’ll enjoy the experience. If not, well, check out your nearest boutique winery and see what they’re fortifying. Try it after dinner with a little chocolate. It would be utterly indecent of you not to. * Not hard at all. In fact, we did miss it. We walked right past it, to the resort hotel nearby. We inquired at the desk, they told us we’d overshot our stop by about fifty feet, and we thanked them. In walking back to Prager, I caught my head, pretty much the whole left side of my face, on a tree branch and cut myself pretty good. As Sonja was investigating my wounds, ants from a nearby decaying log climbed up my leg, and for most of the rest of the day Sonja would reach over and flick one off of me from time to time. All of this misfortune, however, is not the fault of Port wine. Try Port anyway. This photo is one Sonja found on Yelp. We were so caught up in tasting Port that we forgot to take pictures! Photo credit goes to Mona W on Yelp. Check out the other pics. The are pretty cool. And as I told Sonja, my first exposure to Port came at Loxton Vineyards in Sonoma; one taste and I was sold. I brought a bottle back with me and have since checked out other Ports.